Keeping Up ... with the Joneses: Misplaced "development" expenditure? 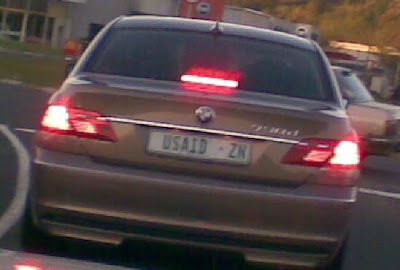 While driving to church last night, I saw this BMW 730d driving through the centre of Pietermaritzburg. According to BMW South Africa, the current list price of this "base model" in the 7-Series range is R947,000 (assuming that no "extras" have been fitted). If this car indeed does belong to the United States Agency for International Development, can one conclude that our politicians' penchant for expensive cars is based on "First World" benchmarks? Surely a "development agency" should be leading the way by providing their officials with more modest transport? If one were to be gracious enough to concede that the stresses of working in Darkest Africa justifies the "right" of such officials to cosset their derrieres with leather upholstery, a BMW 320i Start at R299,000 should fit the bill nicely - leaving R648,000 in the budget to "divert" to "development" projects. My Mom's one client, a construction company specialising in low-cost housing, could build around 11 houses for this sort of money. Alternately, such an amount could cover the stipend budget for the entire current contingent of seminarians for six months. Or provide 125 needy people with R100 per week for a year. It just makes one wonder where the priorities of these so-called "civil servants" and "development agents" lie.